Kolegaon is a village on the very outskirts of the administrative area of the Kalyan-Dombivali Municipal Corporation, in Thane District. Those who know where Mumbai is, the Kalyan-Dombivali area itself is about a two-hour train journey from Mumbai. Actually, Kolegaon was a gram panchayat (governed by locally elected village council) till just a few months ago, when it was incorporated within the larger Municipal Corporation. It is however still a good 30 min drive away from the heart of Dombivali, and further from Kalyan. Due to the Badlapur highway cutting right across the middle of the village, reaching it by public transport is not too difficult. It still costs a lot – both in terms of time and money (Rs. 25 for one seat for a half hour ride one way from Kalyan station). The population is dominated by who are known as gaonwalle, literally, ‘villagers’. They are people from the dominant Agri caste, who own much of the land in all the villages around this area. All the others are by definition then, outsiders. Kolegaon is considered to be progressive compared to nearby villages, because all the people live more or less peacefully together, a primary reason being, as claimed by the gaonwalle, that everyone here speaks the same language – Marathi, the language of the gaonwalle. It is a wonder how this feat has been achieved, especially when the village is also populated by large number of migrants from North-India, South-India or other parts of Maharashtra. It is also considered progressive because girls and women, according to the residents, can move about without fear of sexual harassment. Later, one of the girls, while speaking on “Who am I? What are the influences that ‘made’ me?” said that she is unable to answer this fully because she has been disallowed from continuing her studies after class 10, and is struggling to find herself since then. A boy while answering the same question, said that his elder sister was not allowed to continue her studies after class 10, and seeing her hurt and pain, he resolved to fulfill her dream by becoming the first child in the family to study beyond. Realities of poverty and superstition are the same for everyone, but their experiences and impact are quite different on girls and boys. In the same session, there was one boy who, according to his teammates, had nothing to share about himself. Asked to at least tell us his name, it was immediately apparent that he couldn’t understand Marathi. 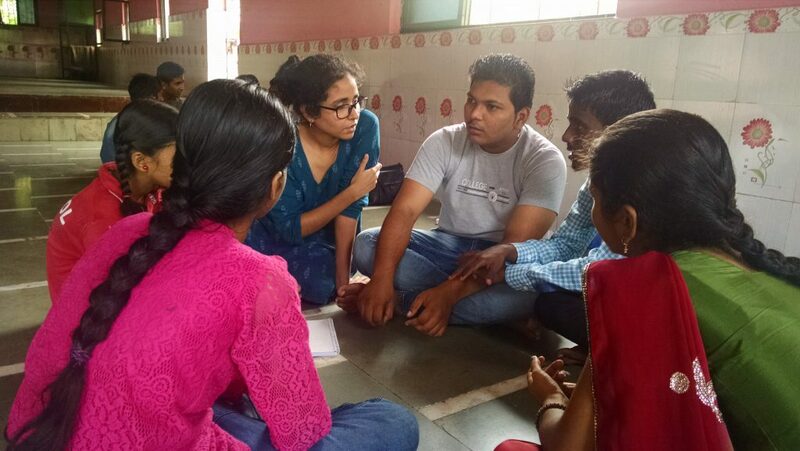 He was told by the Anubhuti facilitator, “Are you comfortable in Hindi? Speak in Hindi, there is no problem at all.” In response, there were multiple, determined voices from the group, “Oh no, everyone here speaks Marathi” – a stock response that we have heard every time we have asked about people’s language in this village – note the awareness about the fact that not everyone here is Marathi, but that everyone here still speaks only Marathi. The boy stopped mid-nod just as he had begun to agree about his comfort level of expressing himself in Hindi. His eyes expressed fear. It could be fear of speaking in front of a group, or something else. It was a success for the group that his teammates – all Marathi-speaking – resolved to communicate with him however they could, and share with us his idea of who he is. It turned out that he sees himself as a good dancer. Everyone looked at him appreciatively – divisions of language having momentarily been won over by the shared passion of dance among young people. They had in that moment, perhaps unknowingly, supported his fundamental right to expression. As we continued to speak about influences on our lives, one of the girls said that her ‘choice’ to keep fasts has surely been influenced, and is not her individual choice. Many girls and boys agreed with her. Another girl said that she sees herself as an independant person who loves to live freely, but being a girl, she manages to live thus very rarely. Boys nodded at her, divisions of gender having been forgotten as they acknowledged her struggle as a shared youthful dream to break free. The group had thus again supported, in this moment of sharing, her right to freedom. 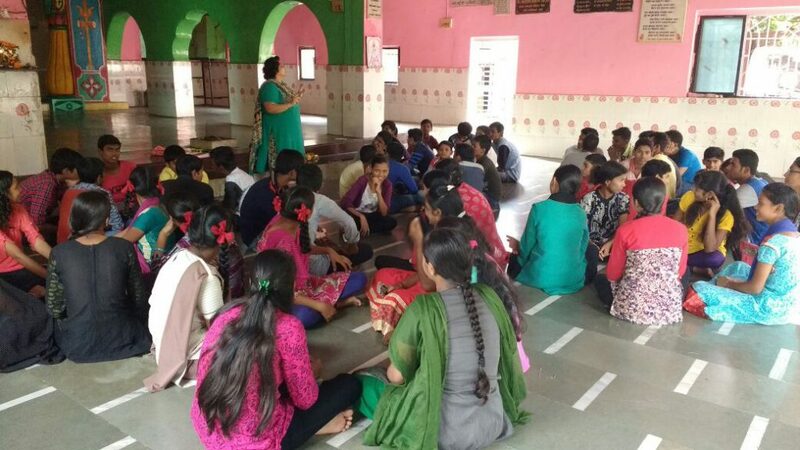 Having heard about each other’s struggles, fears and dreams, the group resolved to become positive influences for each other; if some negative influences (restrictions from family, poverty, social norms, superstitions) could impact their lives so much, why couldn’t they try to reverse these by their own efforts? 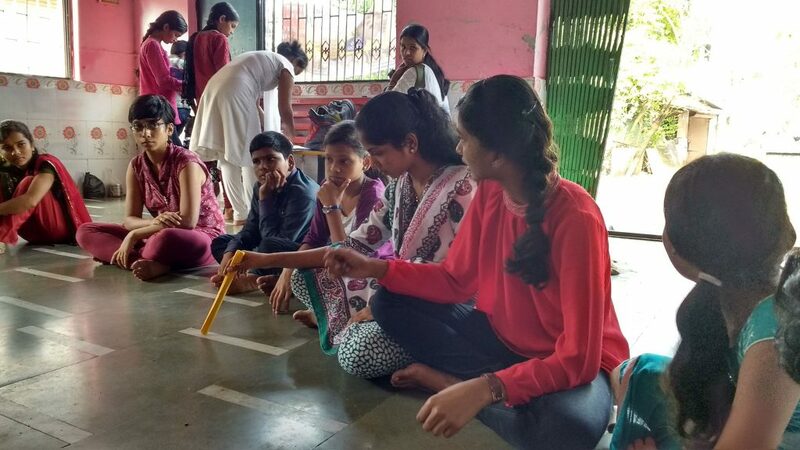 Youth of Kolegaon had thus taken their first step towards organic leadership – a leadership that was emerging from their own collective life experiences, and from a shared resolve to bring about equity.